Datura inermis Juss. ex Jacq. Datura stramonium var. chalybea W. D. J. Koch, nom. illeg. 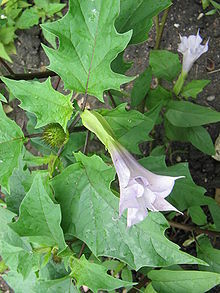 Datura stramonium var. tatula (L.) Torr. ↑ "Datura stramonium information from NPGS/GRIN". สืบค้นเมื่อ 2008-02-05. ↑ AJ Giannini,Drugs of Abuse--Second Edition. Los Angeles, Practice Management Information Corporation, pp.48-51. ISBN 1-57066-053-0. หน้านี้แก้ไขล่าสุดเมื่อวันที่ 22 พฤษภาคม 2561 เวลา 19:43 น.